Back in May, 1963, then-Attorney General Robert Kennedy invited a select group of black entertainers to meet with him at his father’s apartment in New York City. For a rich kid from Boston who’d had virtually no exposure to the black struggle, that was pretty surprising. In his book, The Promise and the Dream, David Margolick says the relationship between Robert Kennedy and Martin Luther King Jr. was … cautious. The accompanying publicity moved the recalcitrant landlord to take care of the building’s vermin problem. “There were people — mainly in the Senate and the Congress — who said ‘starvation does not exist in America.’ ” The senator’s eyewitness accounts showed that was wishful thinking. Despite being one of the wealthiest countries on earth, the United States had a hunger problem it didn’t want to see. During the late ’60s, California farmworkers, most of them Mexican-American, were struggling to bring attention to their abysmal working conditions. Life-long labor activist Dolores Huerta says Robert Kennedy made several visits to the striking farm workers she and Cesar Chavez were organizing in the fields of Delano, Calif.
“When the Senator came to Delano, it definitely put us on the national scene,” Huerta remembers. He came more than once. And he established a lasting friendship with Cesar Chavez, and was with Chavez when he ended a grueling 25-day water-only hunger strike. “Chavez understood that this was one of the only white politicians — maybe the only one — who truly and instantaneously got what was going on with the farm workers,” says biographer Larry Tye. “When you go into many Latinos’ family homes, you’ll often see a tapestry on the wall, and it’s Dr. King, John Kennedy and Bobby Kennedy.” The same triumvirate shows up in black homes and churches. 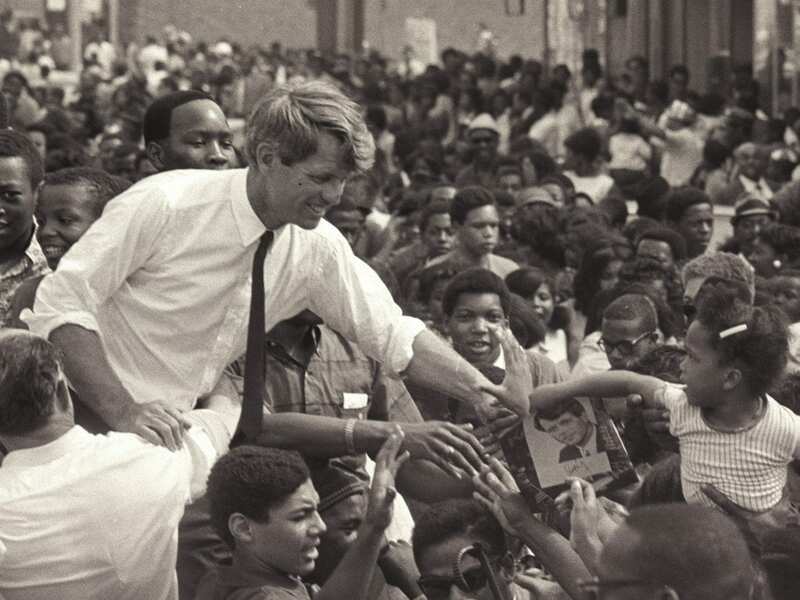 Which perhaps explains why, this week, there will be celebrations of Bobby Kennedy’s life and work in several black and brown communities across the country. He is gone, yes — but nowhere near forgotten.